Super8, a team of four students drawn from France, Italy, Norway and Poland are the winners of this year’s European Sci-Tech Challenge final, an initiative developed by Junior Achievement-Young Enterprise Europe in partnership with ExxonMobil in which teenage students from nine different countries work together in multi-country teams to solve a tricky engineering problem. The challenge facing this year’s competitors was to ‘design the safest, fastest and most energy efficient Formula 1 racing car for the 2040 F1 season’. The students who travelled from schools in the UK, France, Italy, Belgium, Norway, the Netherlands, Russia, Poland and Romania, had to overcome language and cultural differences and work effectively together to develop the most promising solution. The choice of this year’s challenge was highly appropriate. As part of the 20th anniversary of the technology partnership between ExxonMobil and McLaren Mercedes, the event took place at the state-of-the-art McLaren Technology Centre in Woking, UK, where the teams could draw upon inspiration from their surroundings and seek guidance on fuels and lubricants from ExxonMobil business volunteers, while engineering advice was provided by volunteers from the McLaren Mercedes Formula 1 team. Each of the 12 teams had just 24 hours to develop their own unique idea for a safe, fast and energy efficient Formula 1 racing car for the 2040 F1 season. They then had to present their proposals to a panel of senior judges from ExxonMobil, McLaren Mercedes, Young Enterprise UK (YE UK) and the University of Surrey who quizzed them on the finer details of their plans. After much deliberation the judges chose team Super8 which proposed an innovative range of ideas based on a solar-powered electric engine. The Sci-Tech Challenge combines the industry expertise of ExxonMobil with the JA-YE Europe experience in entrepreneurial education. The initiative aims to motivate students to consider STEM (Science, Technology, Engineering and Maths) oriented careers, raise their awareness of the importance of STEM skills and learn how they can be applied in enterprising ways to tackle the challenges of tomorrow. Since the start of the programme five years ago, over 600 business volunteers from ExxonMobil have worked with more than 40,000 Sci-Tech Challenge students to provide them with hands-on experience of solving real-world business and energy related challenges through the application of STEM skills. This year’s final followed national heats in which schools from around Europe competed. All of the 65 students competing in the final were members of winning teams at the national heats. 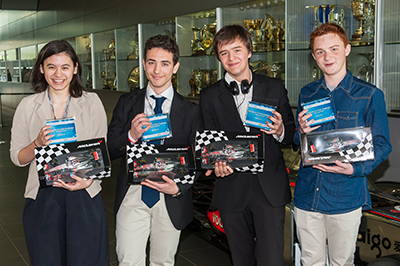 Altogether more than 10,000 students across Europe participated in this year’s Sci-Tech Challenge. ExxonMobil, the largest publicly traded international oil and gas company, uses technology and innovation to help meet the world’s growing energy needs. ExxonMobil holds an industry-leading inventory of resources, is the largest refiner and marketer of petroleum products and its chemical company is one of the largest in the world. The ExxonMobil Foundation is the primary philanthropic arm of Exxon Mobil Corporation in the United States. The foundation and the corporation engage in a range of philanthropic activities that advance education, health and science in the communities where ExxonMobil has significant operations. In 2012, together with its employees and retirees, Exxon Mobil Corporation (NYSE:XOM), its divisions and affiliates, and the ExxonMobil Foundation provided $256 million in contributions worldwide, of which $116 million was dedicated to education. Check our story on Storify here.